Good ol’ Belgium and their beers. I love some good Belgian beers, especially when the beer is backed by some killer artwork and name. I remember when I first started seeing these bottles pop up in our local stores, along with it’s counter part, Triporteur from Heaven. Of course, I went with the Triporteur from Hell. I was interested in this beer for other reasons as well, like I read that B.O.M. Brewery stands for Belgian Original Bakery and Brewery, and as an old tradition, they bake their own malts for their beers. This is a unique treatment tot he brewing process, and for this I applaud their work. 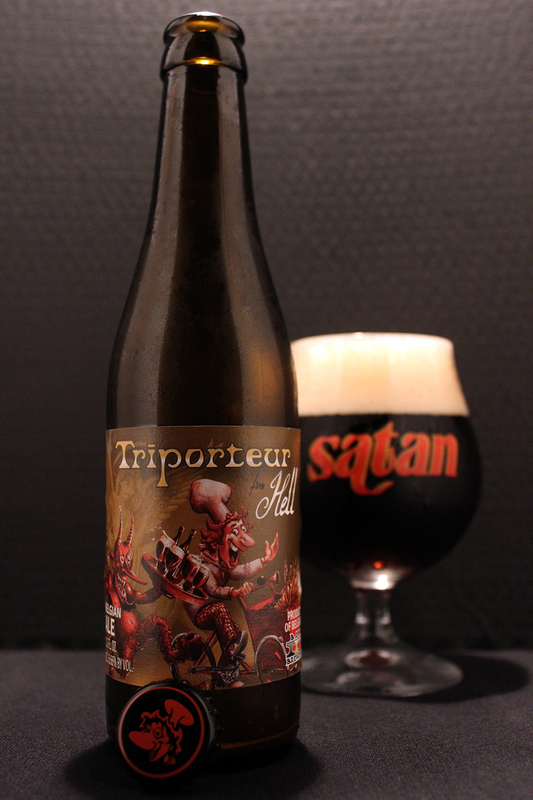 A beer called Triporteur from Hell would not be complete without a nice piece of artwork. 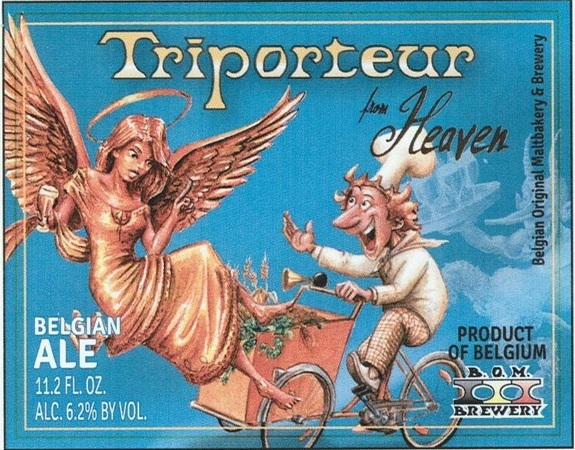 The label features their signature chef character riding a triporteur, a cargo bike that has the barley in the basket. He looks happily riding, as a goat-hoofed red devil excitingly follows him with a serving tray full of goblets of beer, and a couple of bottles. The art looks really sharp as it lays on top of a yellowish, old grunge-paper background. There is a faded female angel looking over them, which I thought was a bit odd, but oh well, it’s still a nice piece of art. Using one of my favorite glasses, a Satan Beer snifter, Triporteur from Hell poured a clear, dark mahogany color topped with a large 2 inch wide tan colored foamy head. The head retained throughout this session, leaving lines of lacing down the glass as I drank this beer. The aroma of this beer was heavy on the roasted, dark malts, followed by caramel, brown sugar/molasses, dark fruits (raisins, figs), some toffee, a little char, and some hints of chocolate. There was also a slight nuttiness to the aroma. The lingering aroma was dark fruits, caramel, and brown sugar. The taste has all the same characters as the aroma. Roasted dark malts, caramel, toffee, and brown sugar/molasses hit the palate first, followed by a big body of dark fruits like, raisins and figs. There is a bit of char, a bit of a nutty flavor, and a hint of chocolate. The aftertaste is dark fruits, caramel, brown sugar, and some slight chocolate. The body was a bit heavy with a slick and velvety mouthfeel. Moderate carbonation. The finish was mouth coating and slick. Overall, this beer was worth a try. I did have more than 1 bottle, and I was able to taste this beer on tap one day. It’s really good. If you see this beer anywhere in your local area, pick it up. I do want to try the other beers produced by B.O.M. Metal Connection: One song that came to mind when trying to find a song to pair with a beer named Triporteur from Hell was Dimmu Borgir’s cover of Twisted Sister’s song, “Burn in Hell.” Growing up in the 1980’s, Twisted Sister was one of my favorite bands. In fact, they still are. I own all their full length albums, and then some. In 2001, when Dimmu Borgir released their 5th studio full length album, Puritanical Euphoric Misanthropia, they recorded their own version of this classic song, and it appeared on the limited edition boxed set of this album. They played it pretty much to the classic sound, not altering the speed of the song, or anything. Shagrath’s vocals are the only thing different, of course because of his Black Metal styled vocals. Their bassist at the time, ICS Vortex sang clean vocals on the chorus, and he nailed it. That is what really got me to like this version. He is now laying down vocals in both Arcturus, and Borknagar. Dimmu Borgir was around since the beginning of the Norwegian Black Metal movement. Their first albums definitely sound a lot different than their newer material. They went to a more symphonic, big sound with clean production. To the elitists out there, liking a band like Dimmu Borgir now-a-days, means poser, or newbie, or whatever they’re calling it. I do agree, they are definitely different from their start, but they still have some pretty catchy memorable songs.